Buttercup Miniatures are pleased to announce that the set of two 1:12th scale knitting patterns for a chair set for the drawing room are now complete. Please note that items from BOTH patterns are shown on the photo above. 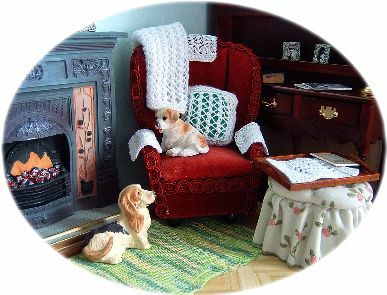 The first pattern includes the instructions for the floor rug, afghan/lap rug and cushion. The second pattern includes instructions for a tray cloth/runner, chair arm covers, plus covers (antimacassars) for chair back and settee back. Full details of materials required to knit the patterns and more photos are given on the links above.